A federal bankruptcy judge and Northrim Bank on Thursday allowed Alaska Dispatch News to use $80,000 of its money to pay its carriers, ensuring that the newspaper will continue to be delivered and barely hitting a cutoff time to get the checks out. At Thursday's hearing, attended by a bevy of attorneys in person and over the phone, Alaska Dispatch News also asked the court to approve a loan of up to $1 million from potential buyers, to approve payment of past-due health insurance premiums for employees, and to approve payment of employee wages. The only issue settled Thursday was that of the carriers, with the other matters scheduled for a continued hearing Friday. Alaska Dispatch News LLC filed for Chapter 11 bankruptcy protection Saturday evening, and new co-publishers, Ryan Binkley of Fairbanks and Jason Evans of Anchorage, emerged as part of a pending sale. The business is bleeding money at a rate of $125,000 a week and owes a long list of vendors more than $2.5 million, according to court filings. The company must now ask a judge for permission to pay even the most basic expenses. In testimony Thursday, Alaska Dispatch News finance director Erin Austin said that if checks weren't written for carriers by Friday morning, those workers "will probably almost entirely walk off the job and we won't have carriers." Alice Rogoff, the former publisher, is still the owner of the company and it's possible another buyer could come forward besides the Binkley Co. LLC and Evans' Alaska Media LLC. In June, the Binkley group made an offer to buy the company for $1, Binkley said in court. That offer ultimately wasn't accepted and now the deal involves the Binkley group putting up as much as $1 million in working capital to keep the newspaper operating throughout the bankruptcy. In testimony Thursday over the phone, Rogoff said she has sunk at least $17 million of her own money into Alaska Dispatch News since buying the previously named Anchorage Daily News in 2014 for $34 million in a sale that included the former Daily News building. "It is extremely painful," she said. "I view this as an indirect investment in something that is extremely important to me and Alaska." Rogoff also said sending the company into bankruptcy court under Chapter 11 protection from creditors was the only way to avoid hurting employees. A central piece of the bankruptcy and financial troubles for Alaska Dispatch News is warehouse space on Northway Drive in East Anchorage, where the newspaper has a printing press and where the Anchorage Daily News was headquartered. Telecommunications company GCI owns the building now after buying it as part of the Daily News sale to Rogoff, and last week GCI filed an eviction lawsuit accusing Alaska Dispatch News of not paying some rent and utility bills. An eviction has the potential to wreck the business because there would be nowhere else to print the newspaper in the near term. But Binkley's attorney said just after Thursday's hearing that the group has reached an agreement with GCI to keep operations going at the Northway site for another two months. 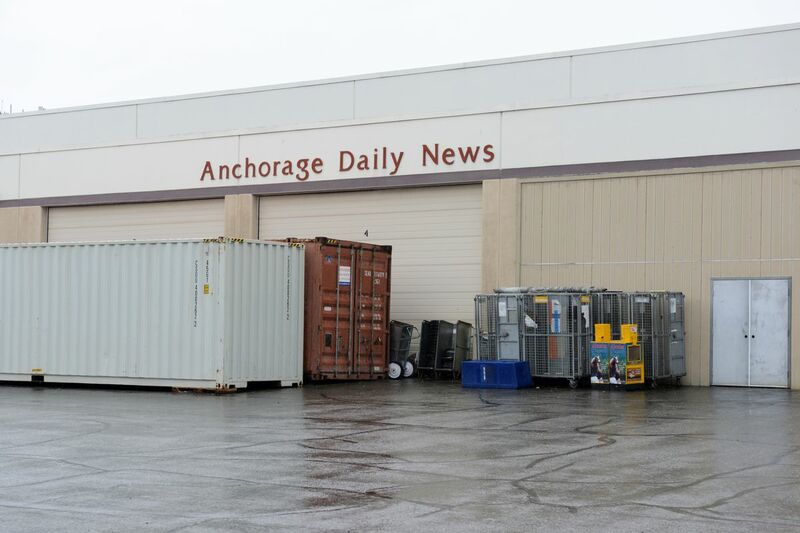 Alaska Dispatch News has another press that is currently sitting in a warehouse on Arctic Boulevard, but there were "complications and delays" in finishing improvements at that site, according to bankruptcy filings, and the space isn't usable. "The Binkleys have agreed to pay the rent that GCI has requested," said Peter Cal, an attorney for GCI, over the phone during the hearing. Alaska Dispatch News "couldn't afford to make payroll next week if it doesn't use the money the Binkleys have," said Erik LeRoy, an attorney representing the Binkley group. John Binkley, a potential 2018 Republican candidate for Alaska governor, was also at the hearing. Ryan, his son, told Alaska Dispatch News earlier this week that "there's no connection" between the possible sale of the newspaper and John Binkley's potential run. Alaska Dispatch News also owes the Municipality of Anchorage more than $56,000 in personal property taxes, the city said in a court filing. The municipality is opposing the company's motion to get the $1 million loan.